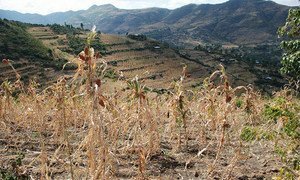 Failed sorghum crop, as the current El Niño pattern, being the strongest ever recorded, has caused severe drought in Ethiopia. Despite the well-coordinated response already under way to offset the impacts of an El Niño-induced drought in Ethiopia, the United Nations humanitarian wing has warned that the scale of the developing emergency exceeds resources and that more funding is urgently needed to ensure food distribution and child protection amid ongoing malnutrition and water shortages. “Resources currently in-hand do not guarantee a full relief food basket for beneficiaries,” said the latest weekly update on Ethiopia compiled by the UN Office for the Coordination of Humanitarian Affairs (OCHA). $1.2 billion is needed for food relief to10.2 million people. However, the current appeal is only funded by one third. Given the lead times necessary for the procurement of relief items, the Government and its international partners have called for early action to this slow onset natural disaster. Fragmentation of delivery is of critical priority as it has negative implications for nutrition and health, and the beneficiaries have to travel more than twice to the food distribution point within short period. Meanwhile, the UN World Food Programme (WFP) is helping deliver food to 2 million people and has started using the humanitarian supplies from the Port of Berbera in Somaliland. Further, the allocation-dispatch-distribution is being finalized in about 4 weeks and the geographic and programmatic priorities for the first quarter of 2016 have also been completed by OCHA’s inter-cluster group and its country team. Child protection is another concern due to drought, as poor families are taking negative coping mechanisms such as child marriage. As such, Child Protection Rapid Assessments (CPRA) validation and drought response planning workshops are being held at national and regional levels. However, financial requirements are also expected to expedite this exercise. The El Niño global climactic event has wreaked havoc on Ethiopia’s summer rains, says OCHA. This comes on the heels of failed spring rains, and has driven food insecurity, malnutrition and water shortages in affected areas of the country. The current El Niño pattern, being the strongest ever recorded, has caused severe drought in the Horn of Africa nation, resulting in crop reduction by 50 to 90 per cent and leaving some 10.2 million people food insecure. As the worst El Niño-induced drought has sparked a sharp deterioration in food security and massive drop in agricultural and pastoral production in Ethiopia, the Food and Agriculture Organization (FAO) today presented a $50 million plan to assist agriculture- and livestock-dependent households and enhance their resilience.